The BULP 2014 Team and the Monumental Fountain House, photo courtesy of Liam Dean-Johnson. My fieldwork experience was crucial for my decision to apply to graduate school. 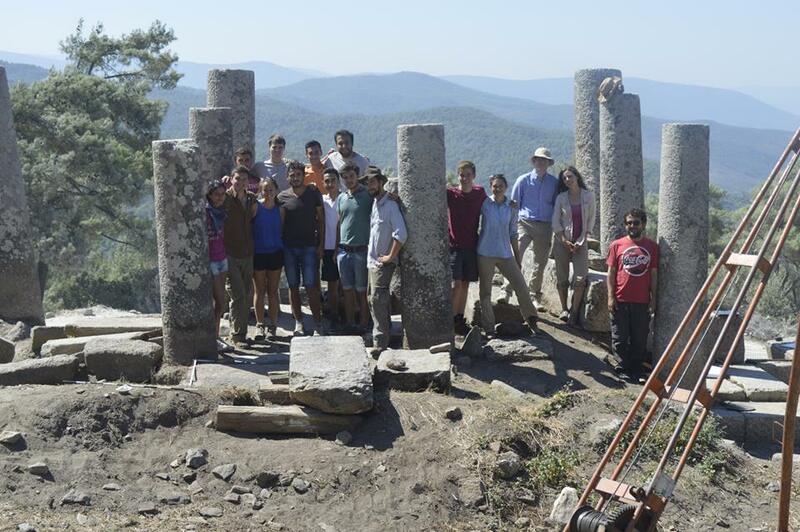 During my junior year at Brown University, I had the opportunity to become involved in a new archaeological project directed by Prof. Felipe Rojas, who is at the Joukowsky Institute for Archaeology and the Ancient World at Brown. Since 2013, I have been part of the Brown University Labraunda Project (BULP). BULP is concerned with the rural sanctuary of Labraunda in ancient Caria, now modern southwestern Turkey, and is part of the greater Labraunda Archaeological Project directed by Dr. Olivier Henry. In antiquity, Labraunda was a sanctuary dedicated to Zeus Labraundos, and people from cities to the north and south came to worship the local deity at an annual festival. The sanctuary is known for its monumentalization by local satraps under the Persian Empire in the mid-4th century BCE: Mausolos (most famous for his Mausoleum, a wonder of the ancient world, located in Halikarnassos, now modern Bodrum) and his brother Idrieus. The current objective of the project is to study a monumental fountain house that lies just outside of the sanctuary. Before our studies, the fountain was largely overlooked because it does not conform to traditional classical architecture, even though its importance is clear due to its position between the two entrance gates to the sanctuary. Our studies suggest that the fountain was built in the mid-4th century BCE and used in some capacity through the Christian period. It is the largest fountain house at Labraunda, and it would have provided rest and refreshment for visitors after a long journey. When I first heard about this project, I never could have imagined where it would lead me. Now as a first-year student in IPCAA, I plan to specialize in Western Anatolia and continue fieldwork in Turkey. The excavations of the monumental fountain house are almost complete, but I look forward to seeing where BULP’s future studies at Labraunda will go.